With the support of our community, the 2019 Book Fair wrapped up with sales equalling 2018’s, assuring us that the love of books and reading is alive and well. Hundreds of books went home with families to be read, shared, and treasured. Thirty-two books were donated to classrooms by generous parents and friends, and the library has ninety-four new books to place on the shelves for our students to enjoy. 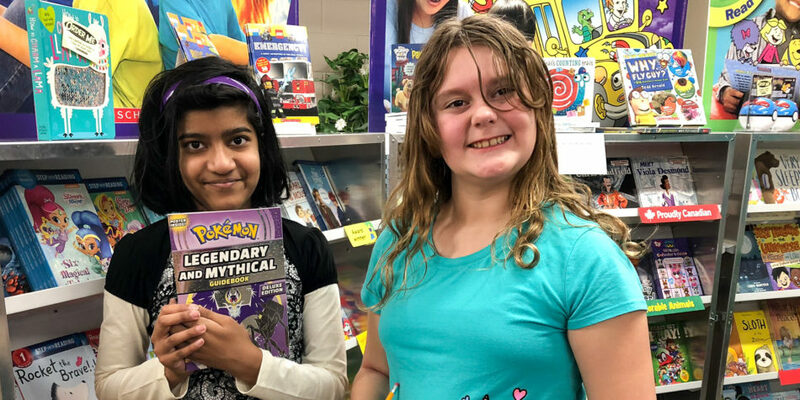 Students were disappointed to learn that Clifford and Geronimo Stilton have retired from traveling to book fairs, but it didn’t seem to dampen their spirits when they arrived at the Fair to the diverse assortment of shiny new books, posters, and school supplies. The school is indebted to the wonderful volunteers who helped make this happen: Dawna Stuart, Lindsey Kilpatrick, Chris & Julie Thomsen, Jaymie Raymond, Marilyn McClelland, and the school staff committee, Courttney Ruecker, Alicia Dyck, Colleen Smart, Stacey Baker, Starr Timmons, and Jen Stenberg.